Wait a minute! Is this another slot developer releasing a slot game with some witty pun based on a celebrated historic figure? This time it is the romantic Italian womanizer Casanova who is the subject of the slot pun. If you are familiar with the legend that is Giacomo Girolamo Casanova then you will know that he was not only famed for his writing and being an adventurer but that he also had a notorious reputation for seducing the ladies. Online slot developer Microgaming turn that legend on its head with this surreal interpretation of the Italian stallion. Now, before I played this game I had it in my head that it would be some sickening mix of the soppy Starlight Kiss slot and the teen love triangle slot Immortal Romance. I could not have been more wrong. As soon as you load this 5 reel, 30 pay-line slot you are thrust into a world where Cashanova is a chauvinistic rooster. Yes, a rooster. Even worse, on the reels there is a chicken posing in a seductive manner as if she’s about to ask our rooster to “draw me like one of your French girls, Jack”. Shameful Titanic reference there! Anyway, you will need to put the random rooster-related images to one side. The reels are full of them. The symbols consist of whipped cream, bottle of champagne, a pipe, some fruit and a magazine called Henhouse that has another image of a seductively posed chicken. It really does beg the question about what Microgaming were smoking when they commissioned this?! 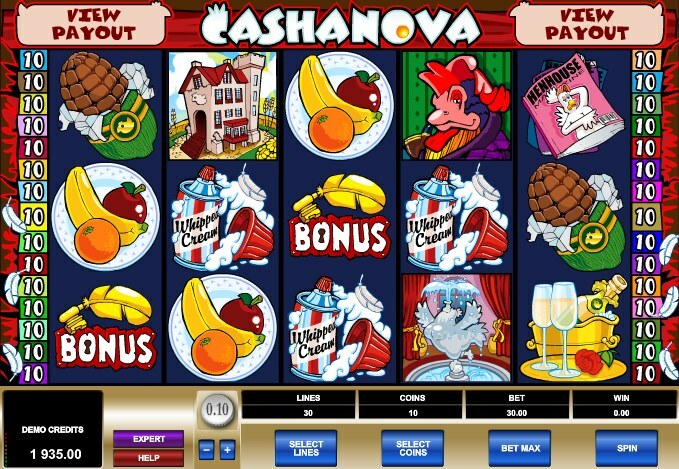 Roger the Rooster, playing the role of Cashanova in this slot, acts as the Wild on the reels and will substitute for all other symbols except for the Scatters and the Bonus symbols to complete winning combinations. If you hit five of his Wild symbols across the reels then you will win 15,000 coins. The Henhouse Scatter symbol will pay out a win if you hit 3, 4 or 5 of them across the reels. The payout will be up to a value of 100x your stake so it has the potential to pay out big with a maximum bet per spin of $75. There are two main bonus features in Cashanova. In the first bonus, you will need three or more Key symbols across the reels to trigger it. Once triggered, you will need to help Roger the Rooster find a gold key. There are a number of hiding places you can search to try and find the key. If you find the key then you will be able to select a gift to try and woo (shudder) Henrietta the Hen and win big prizes. The second bonus feature is not quite as twisted as chicken love. You will trigger it when you hit three or more Free Range Bonus symbols across the reels. You will then be asked to pick one free spins icon, one multiplier icon and one extra win icon. These will reveal up to 15 free spins, a 5x multiplier and an extra win for each free spin. On first impressions, Cashanova is the strange creation of a warped mind that has taken too many drugs. On further experience it actually turns out this slot is quite fun to play. It has gained quite a following amongst slot players around the world and it is easy to see why. It is similar in its bizarre appeal to the hilarious Karate Pig slot from Microgaming and the comical Piggy Riches slot from NetEnt. 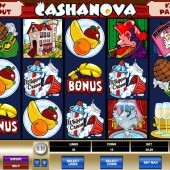 It offers some great slots action including an interactive bonus feature and a free spins bonus round. Plenty to enjoy here and it’s already become one of my guilty pleasures.